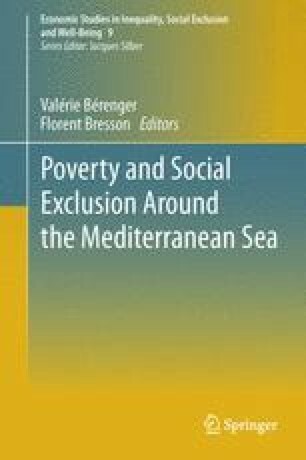 The main goal of this chapter is to undertake a multidimensional poverty analysis in relation to five southern Mediterranean countries, namely Egypt, Lebanon, Morocco, Tunisia, and Turkey. We rely on a broader concept of poverty by considering the deprivations in women’s educational attainments, the possession of durable goods and the consequences of housing conditions, each of which we operationalize by making use of recent developments in multidimensional poverty measurement. This analysis is based on an axiomatic approach to poverty and on the use of stochastic dominance tools to achieve robust results that do not hinge on the choice of poverty line and weighting scheme. Our findings provide comparisons over time for each country and between countries that cannot be obtained when each dimension of poverty is analysed separately, as the approaches take into account the correlations which may exist between different kinds of poverty. Furthermore, in contrast to rankings drawn from cardinal poverty measures (for example, from the Multidimensional Poverty Index), multidimensional tests make it possible to nuance the performance levels reached by certain countries. This paper has been prepared within the framework of the “PROPOORSUDS” project funded by the ANR “French National Agency of Scientific Research”. The authors would like to thank the Ministry of Social Affairs of Lebanon for providing the access to the dataset from Lebanon Consumption Household Budget Survey: 2004–2005. Bérenger, V. & Berthomieu, C. (2008). Final report of FEMISE project FEM 31-06R: Analyse de l’impact de la croissance sur la pauvreté et identification des stratégies de croissance bénéfique aux pauvres (“pro-poor growth strategies”). Etude des cas pour six pays partenaires méditerranéens: Egypte, Israël, Liban, Maroc, Tunisie et Turquie. Available at www.femise.org/PDF/ci2006/FEM31-06R.pdf. Durusoy, S., Köse, S. & Karadeniz, O. (2005). Implementing new strategies for combating poverty in Turkey. South-East Europe Review for Labor and Social Affairs, (04) on www.ceeol.com, 47–76.